Wish you could replace that old mattress? Why not win a new one from Nest Bedding!? Use the widget below to enter to win a brand new Alexander mattress in your preferred size and firmness level. If you think you may want to buy a Nest mattress don’t wait! If you buy a new Nest Bedding mattress between 7/10-27 and also win this giveaway you’ll be credited back for the full amount you paid. It’s win win! Win a brand new Alexander mattress from Nest Bedding! We’re giving away one (1) brand new Nest Bedding Alexander mattress and one (1) brand new Nest Bedding Easy Breather pillow. The Alexander is Nest Bedding’s most advanced and luxurious mattress (every bit on par with Tempur-pedic…and better in some areas). 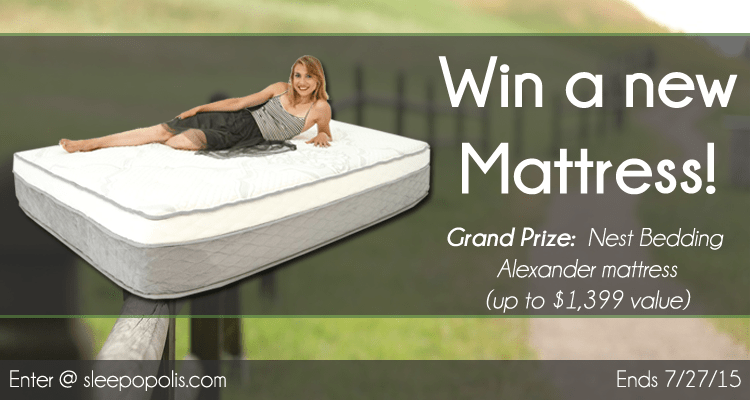 One grand prize winner will select their preferred size and firmness of the Alexander mattress. Additionally, one runner-up winner will win a Nest Bedding Easy Breather pillow in their preferred size. Grand Prize: One (1) Nest Bedding Alexander Signature Select mattress (valued up to $1,399). One (1) grand prize winner will be chosen. You’ll be able to select any size Nest Bedding Alexander Signature Select mattress (Twin, Twin XL, Full, Queen, King, or California King) in your preferred firmness level (soft, medium, or firm). Runner Up Prize: One (1) Nest Bedding Easy Breather pillow (valued up to $129). One (1) runner-up winner will be chosen. You’ll be able to select any size Nest Bedding Easy Breather pillow (Standard, Queen, or King). Entries: You may enter up to 12 times, one for each entry method defined above. Only entries verified through the Gleam voting widget above will be counted. Winner: One (1) grand prize winner and one (1) runner up winner will be randomly selected based on the pool of entries at the conclusion of the giveaway. Winners will be contacted by no later than 7/30/2015. Winners will have 48 hours to respond by email. Non-response will result in disqualification and a new winner will be selected. Winners must provide a US mailing address, email address, and phone number to be able to claim their prize. Like most bedding and mattress companies Nest Bedding strives to create comfortable, supportive, and stylish products. However, this is only half of the story for Nest. They believe that healthy, hygienic, non-toxic, and natural is just as important. Every Nest Bedding mattress, pillow, and other sleep products are crafted without the typical blend of harsh chemicals and synthetic ingredients that normally make it into your bedroom. As a result, Nest Bedding mattresses have virtually zero smell, are healthy, and delightful to sleep on. Check out our Nest review series below for more information. Sleepopolis giveaways and contests just wouldn’t be possible without our sponsors. Many thanks to Nest Bedding for donating all of the prizes for this giveaway! Many thanks to our sponsor for this giveaway, Nest Bedding! lov to win 3 dogs and hubby!!!! This is an older giveaway, but stay tuned. I’ve got several giveaways coming up over the next few weeks! Thank you to all who participated and congrats to the winners! Watching the unboxing was quite interesting! I do have one concern in that I am allergic to latex. As my mattress is a hand-me-down that was already a hand-me-down, I very much need a new one, but I am worried as to whether or not the latex content would be safe. Thanks! I think this is a question best for your doctor. I’m not a doctor and I cannot say what type of affect this might have for you personally. That said, bear in mind there is no latex in the Nest Alexander medium firmness (there is only latex in the soft and hard firmness levels). If you were to select that firmness level you would be fine. Old bed is 15 yrs old! What a lovely and generous offer! American made, natural and additive free, and reasonably priced! I looked at this company’s mattresses while doing research on Sleepopolis, and I am impressed with their quality and dedication in providing the public an alternative to the big box store “chock full of junk” mattresses. I would love to drift away to my dreams on this mattress, and not worry about any sea of toxicity while my head is laying down. Interesting bio and great job, sharing and entering! With both of us in need of back surgery we need a new mattress! I HOPE I WIN I HAD A VERY BAD CAR ACCIDENT IN 2010 I HAVE HAD A HARD TIME WITH SLEEPING I DON’T REMEMBER THE LAST TIME I HAVE HAD A GOOD SLEEP. Would be nice to win I sure need a new mattress. What a great looking mattress. I want to win this! My husband has had back surgery and I really believe a new mattress would help. Thanks for the opportunity. If I win do I just get a mattress or do I get box springs too? That is the question. I would love to have a new mattress. The high quality one we bought two years ago is starting to squeak. Thanks for your kind words, Ginger! I’m glad you found my reviews to be helpful. Double check and make sure you logged into Gleam with an email and then click the entry options you want to do (or have already done), that will make sure they update and should add your Twitter entries. Great website. Thanks for the informative reviews. I sure could use a new mattress as well….. good luck! I need soft but firm bed and this mattress will do great of my stiff and painful body. What dreams I could dream while sleeping on this mattress! Looks great. Hope it lives up to the reviews. I can assure you it certainly does live up to the review. The Best Bed I have ever created! Thanks for stopping by, Joe! This is Joe Alexander, founder of Nest Bedding and creator of the Alexander mattress. This looks so easy even I could do it. Really nice. Thanks, Diane! I’m glad you found it helpful. Have seen and loved your mattresses, but never lucky enough to afford one. Your mattress looks fantastic.. would love to own one!! Awesome giveaway, Thank you! I’ve got 2 pre-teen grandsons coming to visit this summer. I’ve yet to get a mattress except two twin air matteresses. Yikes! I did not hear you say if it were soft or firm lol. I love that it is rolled up like that! Would made it easier to get into the house. Very good review btw! The Alexander mattress that I reviewed was the medium firmness. For the giveaway the winner will be able to select their preferred firmness level, soft, medium, or firm. Typical man letting the woman do all the work while he video tapes. :) My first reaction was whoa this mattress can’t be that good if it came in a box like that. Fun to watch it grow into a typical mattress size by the end! It looks fantastic and looks like your on a cloud. Would love this mattress. My mattress springs are giving way that’s for sure. Thank you for the opportunity to enter. You’re very welcome! Good luck to you.